If you are pondering a Sam’s Club membership, or already have one, there are a few things in the store that are great deals you should make sure to grab. Be careful though, not everything in the store is a deal. 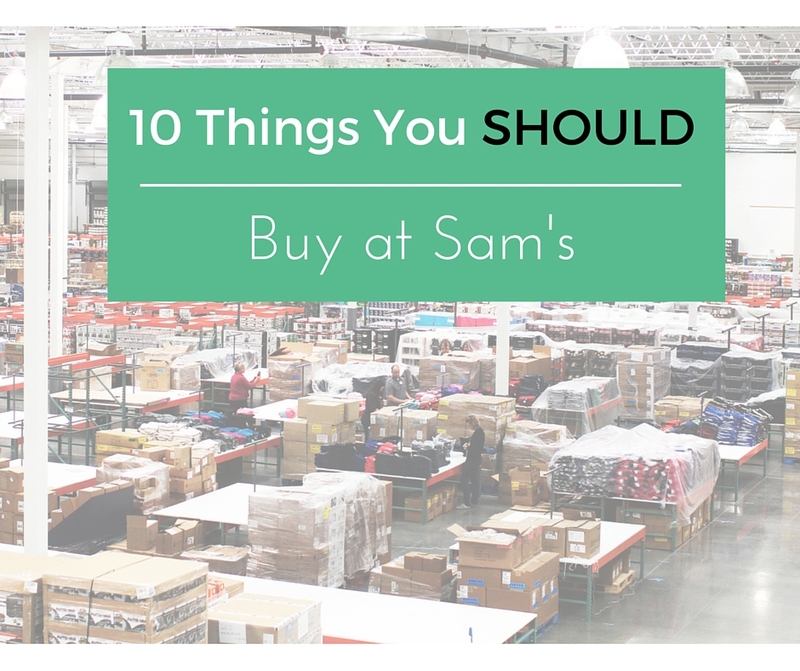 Yesterday I highlighted 10 things not to buy at Sam’s, so avoid those items and stick with this list the next time you are in the store. Grab 3 lb bags of frozen fruit for $9, or $3 per lb. 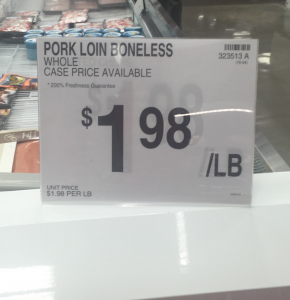 This is equal to the sale price we will see in other stores, however this is the regular price without having to wait for the sale. Look for various varieties of mixed berries and tropical fruits. While they have good prices on most of the dairy section, the price for Cheese at Sam’s is the best deal around. 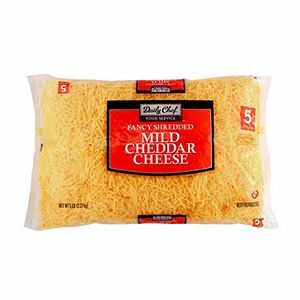 Grab 5 lb bags of shredded cheese for $11.78. That comes to $2.35 per 16 oz, the same size at the grocery store would be $4-$5 on sale. If you’ve got some big baking plans, then the huge bags of flour and various sugars will be a great savings. Flour comes in a 12 lb bag for $4.98, at the grocery store we regularly see 4 lb bags for $2, so this is a $1 savings at Sam’s. Grab Brown Sugar and Powdered Sugar, 7 lb bags, for $4.39. Based on sale prices in other stores, these bags will save you $3 if not more. We can find super cheaper sugar on sale with coupons, but only around the holidays. This is a great savings any time of the year. Buying pecans every year for the holidays is painful with grocery prices. On sale in a grocery store you’ll still find pecans for around $8-$9 per lb. 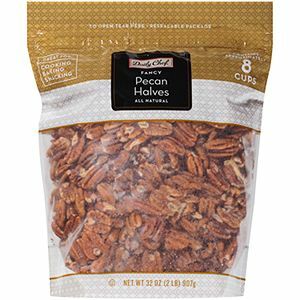 At Sam’s they have Pecan Halves in 2 lb bags for $13.48, or $6.74 per lb. The price for Almonds is just a good. If you don’t need this many, stick them in the freezer. They will last just fine for quite a while. All are slightly cheaper than grocery store sale prices. Note: If you can’t eat bulk lettuce before it goes bad then you haven’t saved anything. Don’t go overboard on items that can’t be frozen before they go bad. Tip: If you want to get a lot ask for the “case price” to save a little bit more over the advertised price. If you have medication that you take daily like allergy or antacids, check out the house brands at Sam’s. You can get 600 Benadryl for $4.68 or 1200 Ibuprofen or Acetaminophen for $10.88. There are many other great prices like these for house brands. It’s really not comparable to any store sale at this bulk size or value. So… stock up and enjoy the savings. Just be careful that it doesn’t all go bad before you use it. Note: They are also known for good prescription prices. I encourage everyone to call around and price match their prescriptions at pharmacies that allow that, so at least make sure you are getting a deal before routinely using them. I know most of us don’t need 160 disposable coffee cups (with lids)… but for those that do, Sam’s has a great price. We can get 20-25 ct packages in grocery stores for $4 on sale. At Sam’s you’ll get 8 times that many cups for $13.36! Get ready for the holidays and any other big battery needs you have at Sam’s. They sell packages that are 2 or 3 times the size of other stores. For AA batteries, get 48 batteries for $17.98 or 37.5¢ per battery. 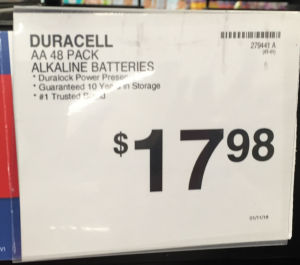 The same number of batteries at other stores would be $32.22 or 67¢ per battery. That means you are saving almost half! I remember even as a little girl, we always went to Sam’s for tires. They are still known for great prices and now they actually have a price guarantee. If you find tires with installation (what they call the “all in” price) cheaper somewhere else, they will match the price! Are there any other items you’ve found that are definitely a deal?